Who was Miss Soul? 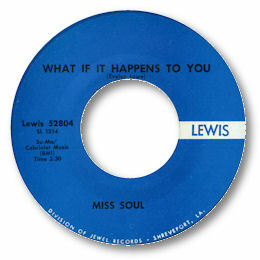 I’m afraid I don’t know but I do know that she was a fine vocalist who showed her fire and control on the only 45 I’m aware of for Stan Lewis’ own label. “What If It Happens To You” is a good well written ballad which could have been better if the drummer had played it straight instead of adding some funk touches, and if the female chorus had been pushed a little further back into the mix. But despite these minor quibbles this 45 – like others on the label by Major Smith for example – are well worth seeking out. UPDATE ~ Naoya Yamauchi has pointed out that the writer of both sides of the 45 is Evelyn Lowe and says that it is likey that this is Miss Soul's real name. I'm grateful to Naoya for this piece of detective work.